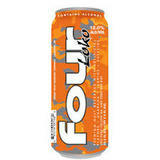 It’s neon-orange color is best hidden inside it’s opaque can. It leaves the distinctive ‘Sparks Tongue’ artifact, making even the most uptight teetotaler look like a kid sucking down juice boxes with an orange tongue. I imagined the same fate had I finished the Blue Raspberry Flavor, leaving me with a blue tongue.